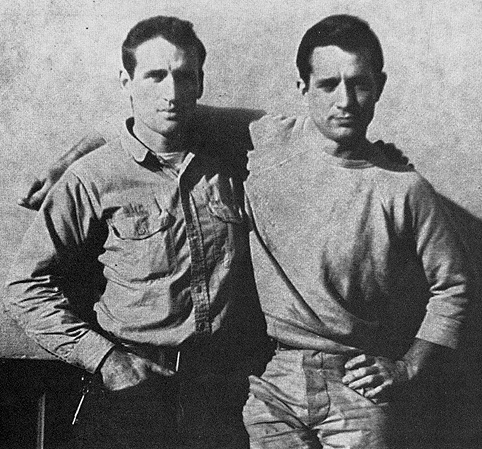 Like Mérger’s book about Paris bohemians, the novels of Jack Kerouac chronicled the half-imagined, half-real lives of the artists. His On the Road and Ginsberg’s Howl seemed to awaken the collective American id, arousing desire and fear, rage and envy. The principal writers of the Beat Generation--Allen Ginsberg, William Burroughs, and Jack Kerouac--had met in New York City in the early 1940s, when Ginsberg and Kerouac were students at Columbia University. They were experimenting with new writing based on uncensored self-expression and altered states of consciousness induced by trance or drugs. Joined by Neal Cassady, Gregory Corso, and Herbert Huncke, they hung around Times Square, fascinated by marginal subcultures, and picked up the style and language of addicts, con men, carnies, hustlers, and small-timers. In the world of the dispossessed urban dweller they saw an escape from postwar mass society.